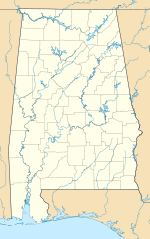 Thomas C. Russell Field (IATA: ALX, ICAO: KALX, FAA LID: ALX) is a city-owned public-use airport located two nautical miles (4 km) southwest of the central business district of Alexander City, a city in Tallapoosa County, Alabama, United States. This airport is included in the FAA's National Plan of Integrated Airport Systems for 2011–2015 and 2009–2013, both of which categorized it as a general aviation facility. Thomas C. Russell Field covers an area of 293 acres (119 ha) at an elevation of 686 feet (209 m) above mean sea level. It has one runway designated 18/36 with an asphalt surface measuring 5,422 by 96 feet (1,653 x 29 m). For the 12-month period ending December 9, 2009, the airport had 33,312 aircraft operations, an average of 91 per day: 91% general aviation and 9% military. At that time there were 26 aircraft based at this airport: 69.% single-engine, 27% multi-engine and 4% helicopter. ^ a b c d FAA Airport Master Record for ALX (Form 5010 PDF). Federal Aviation Administration. Effective January 5, 2017. ^ "2011–2015 NPIAS Report, Appendix A (PDF, 2.03 MB)" (PDF). 2011–2015 National Plan of Integrated Airport Systems. Federal Aviation Administration. 4 October 2010. ^ "2009–2013 NPIAS Report, Appendix A: Part 1 (PDF, 1.33 MB)" (PDF). 2009–2013 National Plan of Integrated Airport Systems. Federal Aviation Administration. 15 October 2008. This page was last edited on 2 October 2018, at 01:21 (UTC).